Sign up for my newsletter and get a printable St. James the Great Notebook paper -Free! 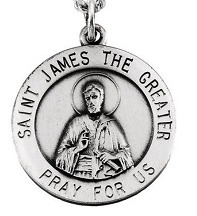 James the Greater was the brother of John the Evangelist, the beloved apostle. Our Lord referred to the two brothers together as ""Sons of Thunder." They were the sons of Zebedee and Salome, and like their father, the brothers were fishermen on the Sea of Galilee. James and John were together when Jesus called them and their friends Simon and Andrew, to be "fishers of men." Among the 12 apostles, James held a special place. He was there when Jesus raised Jairus' daughter from the dead; he was present at the transfiguration along with John and Peter, and he slept in the Garden of Gethesemane. The mother of James and John asked for a special place for her sons in Mathew 20:20. As it turns out, they both did. Legend has it that after the Ascension of Jesus, James traveled to preached in Spain. He returned to the Holy Land and was martyred. (Acts 12:1). King Herod Agrippa I killed him with a sword in an early persecution of the Church. There is a story that the man who arrested James became a convert after hearing James speak at his trial and was executed with him. 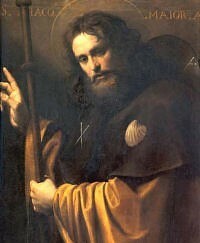 Legend has it that after his death, Christians put the remains of St. James on a rudderless ship that landed in Spain. After some negotiations and problems with the local Celtic Queen Lupa (who later converted) the saint's remains were put on an ox cart. The Christians determined that they would lay the saint wherever the ox stopped to rest. And that is how St. James came to be buried where the Cathedral of Santiago stands today! (Iago is his name in Spanish). So how did the scallop shell become a symbol of St. James? I've read it two ways -The scallop-shell is very prevalent on the shores of Palestine, so pilgrims would take these shells home and put display them on their hats to show that they had made a pilgrimage to the Holy Lands. 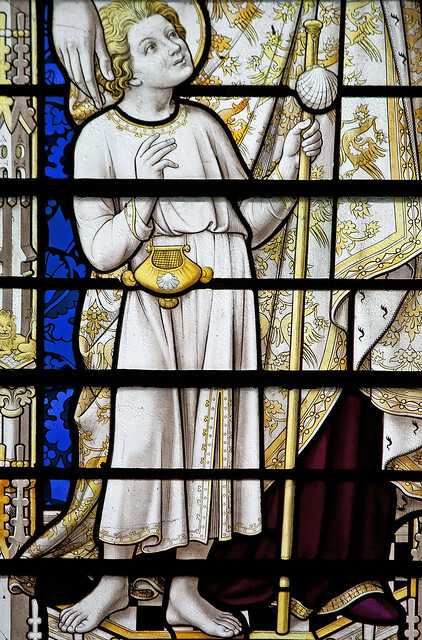 St. James will frequently be portrayed as a pilgrim with a staff and with a scalloped shell. 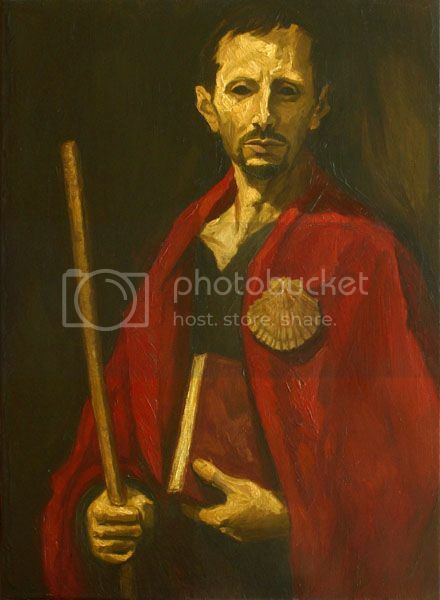 It also seems that when the body of St. James was nearing the shore of the Iberian Peninsula, a man on a horse went out into the water to meet it and went under the water. When the man and horse came up, they were covered with shells! 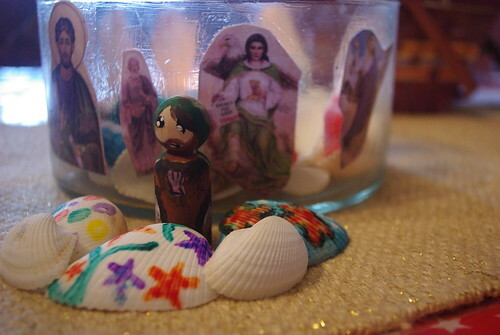 Father Lawrence Lew, OP via Flickr, licensed cc - St. James as a child - note the sea shell included in this piece! This is the day to try oysters on the half shell! or maybe stuffed shells for dinner! 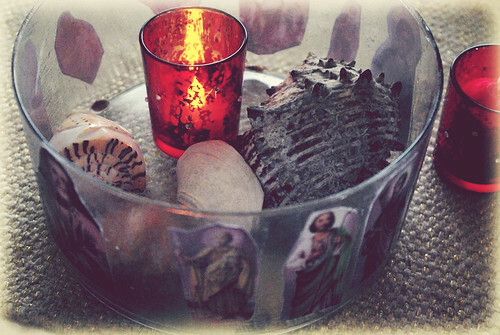 or try some fun shell crafts!